Without any debate, it can be said that the best way to experience India is by experiencing the festivals of this country. A land of cultural and ethnic diversity has a number of festivals celebrated throughout the year. Festivals in India are an occasion when people celebrate, buy new clothes and make merry for days. There is no other country in the world where there is so much diversity in the terms of festivals and cultural identification. There are a number of iconic festivals in India that can give you an experience of the lifetime. Here are a few to start with. Holi is celebrated in the month of March, after the end of spring season in India. It is one of the biggest Indian festivals and is counted as a very fun celebration. It is celebrated all across India and every region has their own special way to celebrate it, Mathura and Vrindavan are two of the places known for the grand Holi celebrations. Lathmar Holi is basically celebrated in Barsana, here women chase men and beat them up with Lathis (sticks). This is an event that attracts thousands of participants as well as tourists who come experience Holi from all parts of the country. On the Ekadashi before Holi, the Banke Bihari temple at Vridnavan celebtrates a unique Holi that is celebrated with flowers instead of colours, and hence it is called Phoolon wali holi. The main Holi procession takes place in Mathura where the grandeur is celebrated at the historical Dwarkadheesh Temple in Mathura. The celebration of colours is a visual and spiritual experience for the visitors. We would recommend you to try some bhang if something is stopping you to join the festivities. Ramzan in Delhi is an event that everyone waits for. Every evening Jama Masjid announces the time to break the Roza (the daily fasting ritual among the Muslim community) with two loud bangs, as the walls of the Mosque illuminate with bright colours. The lane opposite to Jama Masjid is crowded with people of every community who come here to taste the eclectic Arabian cuisine. The end of Winter Solstice is celebrated all across India in grandeur. People cook delicious cuisine, fly kites and welcome the arrival of spring season. In Gujarat, Makar Sankranti is known as Uttarayan and is celebrated on 14th and 15th January. In the morning colourful kites fill the skies which is followed by cooking amazing food in the afternoon. The lovely Fafda Jalebi is a staple diet in this state. After some rest, as the evening arrives people go to their roofs to release paper lamps from their terraces. The sky illuminates with glowing paper lamps all across the sky. It is a surreal moment. St. Francis Xavier was a revered saint who died on 3rd December. He has a church dedicated in Old Goa called Basilica De Bom Jesus and his mummified body is kept in it. Every year, devotes assemble to participate the celebration of St. Francis Xavier. St. Francis Xavier is brought out for to the sight of people only after 10 years, on the day of his feast. It is one of the happiest festivals in Goa. This 2 day festival organized in the month of September, celebrates Guru Padmasambhava’s birth anniversary, who was the founder of Tantric Buddhism (Vajrayana) in Tibet. 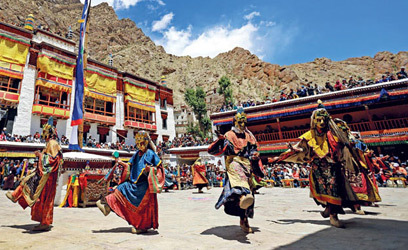 This festival is celebrated by performance of Cham Dance by resident Lamas who dance around the central flagpole in the monastery’s courtyard, on the beats and music of cymbals, drums and long horns. This costumed dance drama tells the Guru Padmasambhava and spreads the message of the victory of good over evil. Hemis festival is a unique experience because of a few reasons. Primarily it is one of the few ways to learn the influence of Buddhism in India and then there is no better way to experience Ladakh while sitting in a stadium surrounded by mighty Himalayan mountains. Durga Puja is the grandest festival of India. Durga Puja’s date usually falls between last week of September and first week of October. It is celebrated in many different styles, in West Bengal, it is probably the grandest way in which the festival is celebrated. Durga Pujo in Bengal is 9 days of eat, dance and make merry. The city of Kolkata is filled with extravagantly lit up and themed pandals, immaculately designed Durga idols in different styles and patterns and impressive lighting to mesmerize you. Women dancing to the tunes of dhol and shankh as worshippers welcome the arrival of Goddess Durga on Earth is probably the biggest symbol of feminism in India. Chhath, also known as Dala Chhath is an important festival celebrated in Bihar, Uttar Pradesh and Madhya Pradesh. Chhath is celebrated in the month of November, a week after Chhath, also known as Dala Chhath is an important festival celebrated in Bihar, Uttar Pradesh and Madhya Pradesh. Chhath is celebrated in the month of November, a week after Dipawali. 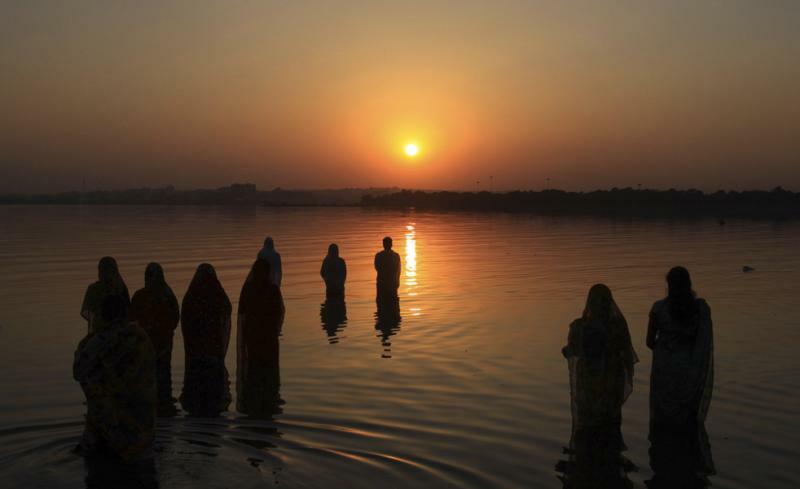 Chhath is one of the few festivals in the world that is dedicated to the Sun God. This festival is celebrated for two days and offerings are made to the setting and rising sun. The symbolism behind the festival is that first the setting sun is worshipped to cast away all the bad memories, next morning rising sun is worshipped as a symbol of new beginning. Chhath symbolizes the fact that no matter how dark the night is, there will be a new day and it is never too late for a fresh start. Banaras is known for its cultural and spiritual appeal that brings travelers here from different parts of the world. The festival of Dev Dipawali is celebrated here on the evening of Kartik Purnima which is almost 14 days after Diwali. The Ghats of Banaras are illuminated with several lamps that brighten the atmosphere. A boat ride in the Ganges gives you a lovely panoramic view of these illuminated ghats. Dev Dipawali is one of the most unique festivals of India and is simply a treat to experience. Pongal is one of the biggest festivals of South India. It is not only celebrated in Tamilnadu but in neighboring states as well as among the Tamils who are working overseas. This festival is primarily a harvest festival, celebrated by farmers for their lush bountiful produce. It is also the beginning of the New Year in the Tamil calendar and is celebrated on 14th of January. The festival is celebrated for four days that includes lovely food preparations, bull fighting in the villages and visiting homes of friends and extended family members. Temples are celebrated in grand style and are decorated with beautiful colorings and designs. 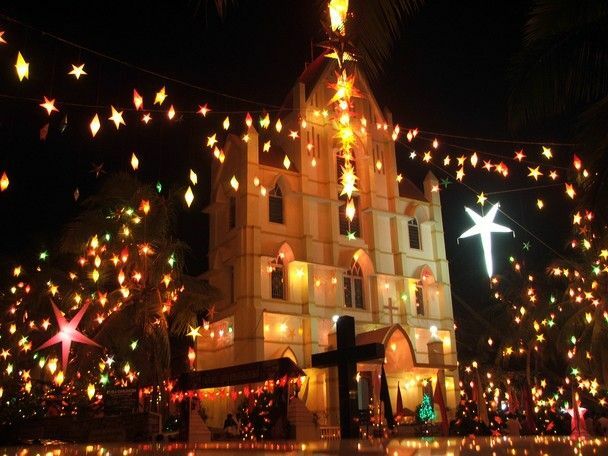 Christmas is one festival that is celebrated by every community. This is the time when most of the people in India travel to places like Goa and Pondicherry. In Pondicherry, the French influence on their culture comes out during Christmas. During Christmas, the Churches are decorated with beautiful decorations, traditional Turkey dinner is organized by hotels and families and folks of local people move around singing Christmas carols. All this in the calmness and the tranquility of this small Union Territory is something that is not to be missed at any cost. Ganesh Chaturthi is the biggest festival of Maharashtra. 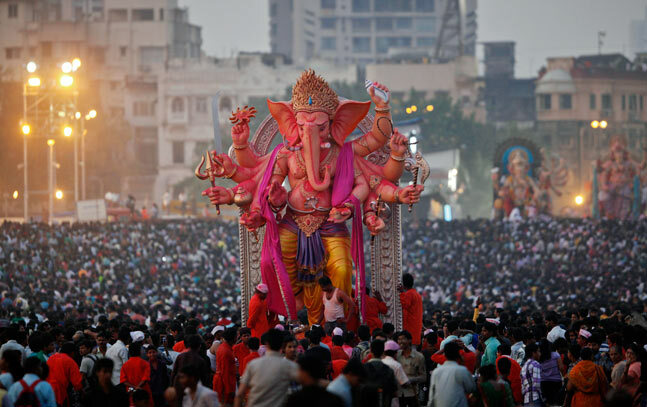 The amount of Enthusiasm at Ganesh Chaturthi is marked by the fact that it is celebrated for 10 days, but it is Mumbai where this festival is organized in the form of grandeur and devotion. The beautiful decorated pandals and ever tasty modaks are two of the reasons to look forward to this festival. Ganesh Chaturthi’s date usually falls on the last week of August or first week of September. Assam is the gateway to North East and is a land of good food, lovely culture and celebrations. 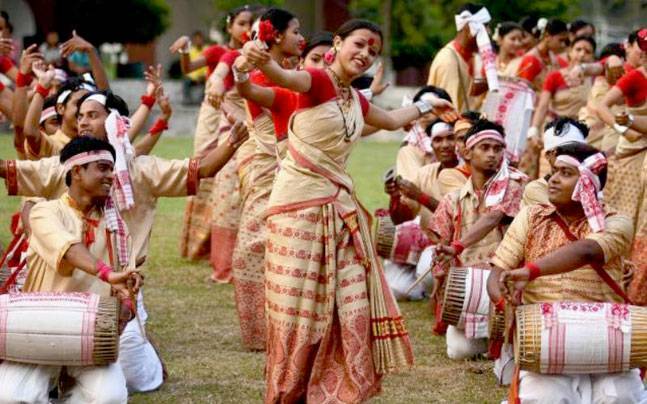 Bihu marks the beginning of traditional New Year in Assam and the celebrations go up to a month. The festival is celebrated with the traditional Bihu dance and huge community feasts. Bihu’s date is marked on 14th or 15th of April. Baisakhi in Punjab – Baisakhi is a festival of Food, music, dance and new outfits. The festival is celebrated by The Sikh community all over the world. Baisakhi marks the harvest of Rabi crops and is celebrated with huge enthusiasm and grandeur on 13th and 14th of April every year. The Hornbill festival organised every year on the first week of December in Kohima, the Capital of Nagaland. It is a cultural extravaganza that not only celebrates the tribal way of life and the modern fusion to it. This 14 day festival invites travellers from all parts of the world with camping and music artists are invited here to perform. Thriussurpuram is one of the important festivals of Kerala. This festival is one of the popular temple festivals of South India and in Kerala it is organised in trissur vadakkumnathan temple. This festival brings cultural extravaganza with beautiful music, Elephants worship rituals and ornate decorations are all over the temples. 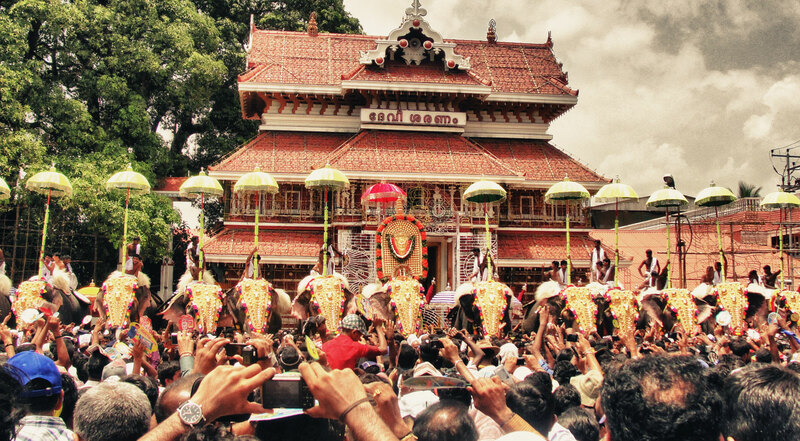 Thrissur festival is a must attend festival in Kerala and is organised during April and May. India has a rich heritage and it clearly comes out during the festivals. While the mentioned above are few of the most important festivals, there are other events that are equally important. From Urs Festival in Agra to Hornbill Festival in Nagaland, celebration never stops when you are in India. All of these festivals look so interesting, especially Holi! So much cultural beauty and talent. Thanks for sharing. This post was fantastic! And the photos were stunning. The cultures outside of the ones I have experienced are always just so fascinating. What a cool article! India has so much to offer and there’s so much tourists can learn about! Of course I’m interested in the Holi festivities because the colors are so fun! Whenever I think of India, for some reason, I think of color… LOTS of color! Their culture is really so rich and colorful, and as seen in these festivals you listed, you can literally see color everywhere. I would want to see the Lathmar Holi… mainly because I want to see the women chase men and beat them up with sticks! That’s not something you see all the time! India really does have the most vibrant, spiritual festivals. I love how they all truly unite to bring forth these celebrations throughout the year. Stunning photo of the kites growing towards the sky. Thanks for sharing. I really like this Indian celebration I’ve always wanted to witness it someday. It’s crazy because it’s very faous nowadays that you find festivals all over the world even in Morocco. Though it is not possible to discuss all the big festivals celebrated across the different states of India, but you have covered most of the major festivals here. India is full of festivals. They have so much of events and festivals with meaning and history. All are related to their own religion but that are all celebrated by all the people in the nation. Great post about India and Festivals.